Stemmler was brought to Northern California in 1961 by brothers Robert and Peter Mondavi of Charles Krug Winery in Napa Valley to solve the problem of secondary fermentations in bottled wines. He was the winemaker at Charles Krug for seven years at a time when the Mondavi brothers began to take over their father’s winery. He consulted for several notable wineries including Inglenook, St. Clement and Raymond, and was hired at Simi in 1970 to reactivate the old Simi Winery in Healdsburg. 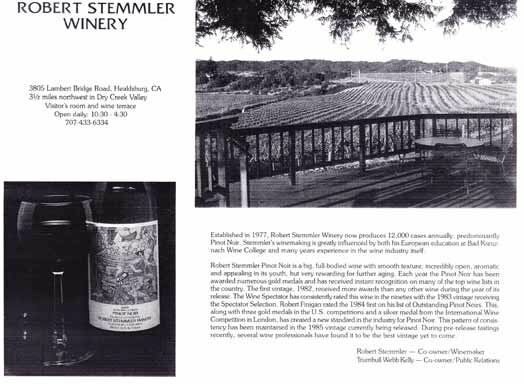 In 1977, Stemmler opened his own eponymous winery in the Dry Creek Valley of Sonoma County in partnership with Trumbull Webb Kelly who was a former educator that managed the tasting room and retail sales. The tasting room at 3805 Lambert Bridge Road in Healdsburg first opened in 1985. I can remember visiting the original tasting room and Robert Stemmler was one of the first Pinot Noirs I cut my teeth on. Stemmler produced a variety of wines including Chardonnay, Sauvignon Blanc, Late Harvest Sauvignon Blanc, Cabernet Sauvignon and Pinot Noir and by 1986 production had reached 12,000 cases, including 3,000 to 5,000 cases of Pinot Noir. Some wine was produced under a second label, Bel Conte, and Stemmler was also a consultant for several small wineries. Stemmler made his first Pinot Noir under his own label in 1982. He considered cool-climate, hillside or mountain vineyards ideal for growing Pinot Noir and preferred old vines for their consistency. 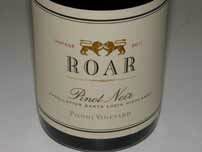 Initially, he sourced Pinot Noir from Jim Forchini’s low-yielding vineyard in the Russian River Valley. 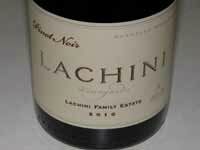 As fate would have it, Forchini was unable to sell four acres of Pinot Noir after the buyer reneged on a promise to buy the grapes, and he was searching for a buyer. Stemmler was not inexperienced with Pinot Noir, having consulted at Davis Bynum in the mid 1970s and worked with Gary Farrell as well who took over the winemaking duties at Davis Bynum in 1978. The 1987 Robert Stemmler Sonoma County Pinot Noir came from six different Sonoma County vineyards, each dry-farmed, over ten years old, and offering low yields. The sources reflected Stemmler’s insistence on quality vineyards. 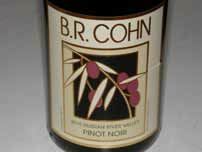 Stemmler sourced Pinot Noir from the Bohan Vineyard in the Sonoma Coast before there was a Sonoma Coast AVA, and received grapes from the Rochioli Vineyard in the Russian River Valley as well. 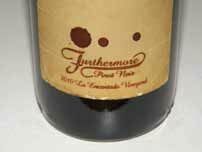 In a matter of a few years, and preceding the attention brought to California Pinot Noir by the Williams Selyem 1985 Rochioli Vineyard Russian River Valley Pinot Noir, Stemmler had set a new standard in the industry for Pinot Noir. Stemmler’s Pinot Noir winemaking was innovative. He preferred limited (5 day) skin contact, fermented the grapes warm at 88ºF with some whole berries, and usually employed natural yeasts. Seeds were filtered before fermentation to reduce tannins and astringency. The wines were racked and blended in January, and aged 12 to 15 months in a combination of French and air-dried American oak barrels (Stemmler became a proponent of air-dried American oak barrels over time), and were bottled without fining or filtering. The wines saw no sulfur until bottling and even then, a very small amount. The resulting wines had moderate alcohol levels and exemplary balance between acidity and tannin. Andre Tchelistcheff was said to describe Stemmler’s Pinot Noir as having, “The sensual aroma of a woman’s leather glove with a hint of her perfume and personal scent.” (Ann Arbor News 6/24/87, Eleanor and Ray Heald) There are many variations of this famous quote over time purportedly attributed to Tchelistcheff in a number of circumstances. Anne Moller-Racke, who founded The Donum Estate, arrived from Germany in 1981 to work at Buena Vista Winery in Carneros and became friends with Stemmler. Buena Vista Winery took a sizable equity position in Robert Stemmler Winery, and Stemmler promoted the label nationwide. Finally, in 1989, Stemmler retired to Palm Springs, California, after winemaking for 35 years, and the Racke family bought his label. 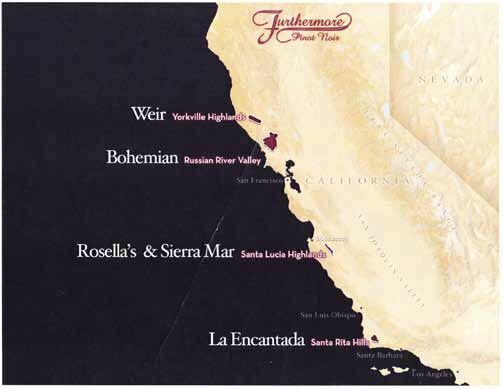 Stemmler wines were initially a wine club and tasting room brand within Buena Vista, but with the sale of Buena Vista and the founding of The Donum Estate, Robert Stemmler became Donum’s sister brand, sharing estate grown fruit and a commitment to quality established by Stemmler. The Robert Stemmler Winery facility in Dry Creek Valley was sold to Pezzi King in 1996. Beginning in 2008, the Robert Stemmler label was shortened to simply, “Stemmler.” The Stemmler estate grown wines are produced by the same winemaking staff as for The Donum Estate wines, and Moller-Racke is the viticulturist in charge of all vineyard management. Both Stemmler and Donum Estate wineries are owned by Winside, Inc. Current releases include a 2011 Estate Grown Carneros Pinot Noir ($44), a 2011 Nugent Vineyard Russian River Valley Pinot Noir ($44), a 2011 Estate Grown Carneros Chardonnay ($24) and a 2012 Estate Grown Sonoma Coast Vin Gris ($20). The website is www.robertstemmlerwinery.com. 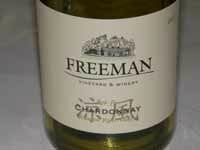 Wines are sold at significant discount to wine club members. It has become an annual tradition for me to visit Paul at his winery at Central Coast Wine Services in Santa Maria each year before World of Pinot Noir in early March. Each time I visit, I discover that Paul has expanded his space and is gradually ramping up his modest production. There is no need to go into detail about Paul Lato as I have written about him extensively in the PinotFile and have thoroughly enjoyed and praised his wines since the 2005 vintage. 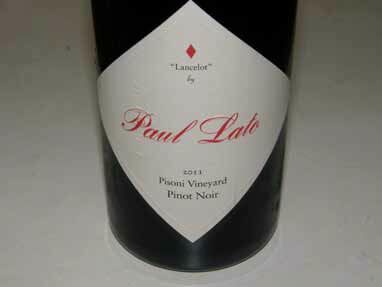 If you like your Pinots elegant with grace, nuance, vibrancy and balance, then Paul Lato is your guy. He is very modest about his accomplishments, but he has an uncanny knack for finding the “sweet spots” in vineyards and sourcing the best possible fruit. 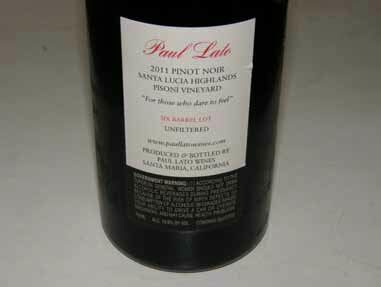 Paul doesn’t make a lot (about 2,500 cases of Pinot Noir, Chardonnay and Syrah), and the wines are only sold through a mailing list and to select restaurants, but if you are fortunate to snag a few bottles, you will be very pleased. You can find Paul each year pouring his wines at the World of Pinot Noir. 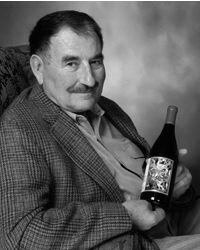 The website, www.paullatowines.com, has been updated with a good description of Paul’s philosophy and vineyard sources. All grapes are 100% de-stemmed during vinification. The first wines below were tasted at the winery and had only been bottled ten days prior. The final wines were tasted at home in September 2013 after 6 months in bottle (Paul had suggested that some of the wines needed time in bottle to make a proper evaluation). The 2011 was a “wild child” according to Paul. “Some kids have tremendous possibilities, wonderful talents waiting to be nurtured, but need just the perfect guidance to express their potential. There was an early frost, a late frost, spans of unusually cool days throughout the growing season. Yields were low, yet it was necessary to drop more fruit. Every underachieving barrel in the winery was sold in bulk to protect the integrity of the vintage.” Paul did a commendable job with what the vintage dealt him. 2011 Paul Lato “Alegria” Hilliard-Bruce Vineyard Sta. 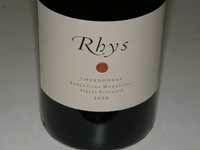 Rita Hills Pinot Noir $70. 2011 Paul Lato “Belle du Jour” Hilliard-Bruce Vineyard Sta. Rita Hills Chardonnay $55. Aged in 45% new French oak. Sancerre is known worldwide for Sauvignon Blanc, and deservedly so, for the Loire Valley region offers a pleasing, refreshing style that is almost universally enjoyed. 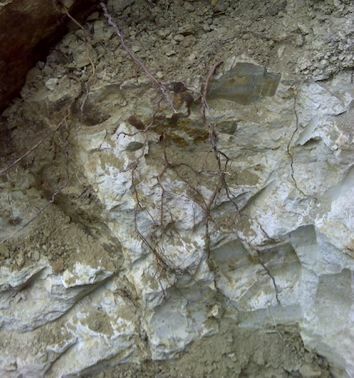 However, as Lettie Teague pointed out in her article on Sancerre (“Wine’s Tom Hanks: Why Everyone Loves Sancerre,” The Wall Street Journal, April 26, 2013), the soils (both pebbly limestone and siliceous clay) are similar to the soils of Champagne and Burgundy, so it is not surprising that Pinot Noir performs admirably in Sancerre as well. 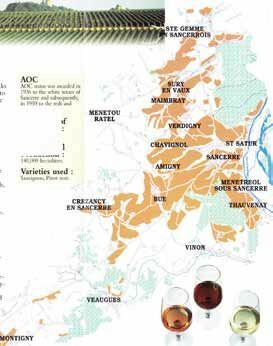 Jim Budd (“Sancerre’s Red Dawn,” Decanter, September 2009) notes that when the first French AOCs were created in 1936, the Sancerre appellation was for whites only. It wasn’t until 1959, that AOC accreditation was awarded to reds and rosés produced from Pinot Noir. Sancerre Pinot Noir was traditionally light and dilute, and the grape was often sold to Champagne houses. 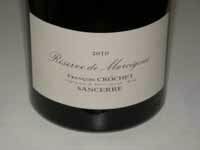 The modern era of Sancerre Pinot Noir did not began until the 1990s when a number of talented Sancerre vignerons began turning to more attentive viticulture of Pinot Noir and vinifying more serious, robust Pinot Noir wines. Evidence of the existence of vines in Sancerre was recorded by Gregory of Tours in 582 in his Historiae Francorum. In the 12th century, cultivation of the vine was given added impetus through the combined efforts of the Augustine monks at St-Satur and the ruling counts of Sancerre. Sancerre was famous for its wines produced from Pinot Noir and exported from the region along the River Loire. 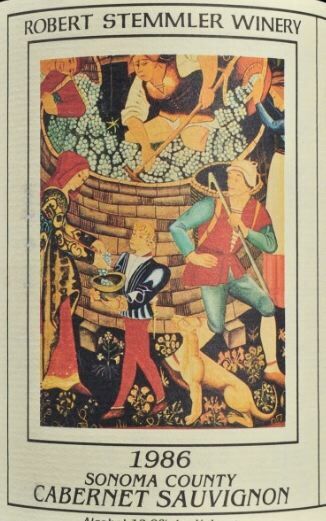 The wine of Sancerre was, in the opinion of Duke Jean de Berry, the finest wine to be found in the entire kingdom. In more modern times, the original vineyards, which were predominantly planted to Pinot Noir, were destroyed by phylloxera at the end of the last century and Sauvignon Blanc was then widely planted. 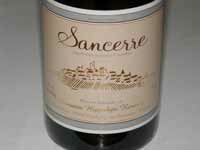 Sancerre red is something of a rarity outside France. Budd reminds that only 22% of the acreage in Sancerre is planted to Pinot Noir, production only accounts for 11% of Sancerre wine, and less than 3% of Sancerre Pinot Noir is exported. I found that many large retailers in the United States carry only a few examples so it was a challenge to find a representative group to sample. Prices are generally quite modest, with many exemplary wines priced under $30. The top red from Alphonse Mellot, Génération XIX, is at the high end at about $90. The vineyards of Sancerre are planted throughout the communes of Bannay, Bué, Crézancy, Menetou-Ratel, Méénetréol, Montigny, St-Satur, Ste-Gemme, Sancerre, Sury-en-vaux, Thauvenay, Veaugues, Verdigny and Vinon. After tasting the following ten wines, I should point out that these wines will not offer the fruit intensity that Americans have come to expect from California and Oregon Pinot Noir. 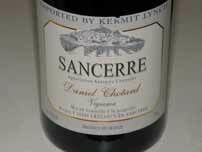 They do offer interesting drinking in a different style and flavor profile, but among the vast number of outstanding North American Pinot Noirs in the same price range, the Sancerre Pinot Noirs will be challenged to find an American audience. My best advice is that if you are curious, stick to a notable importer such as the Kermit Lynch Wine Merchant selections. It is a slow time for wine releases, but this short list is packed with “Too Much Good Stuff,” as the ads for Seven-Eleven proclaim. 13.6% alc., $30. A product of NW Wine Co. Aged 11 months in French oak barrels. · Light reddish-purple hue in the glass. Evocative perfume of dusty cherries and seasoned oak. Noticeable mid palate attack of fresh cherry and cranberry flavors with a citrus-driven, nervy finish. Straightforward, light, and easy to drink, this wine will work beautifully at the dinner table. Central Coast Wine & Food Pop-Up Tasting Tour The first annual Central Coast Wine & Food tour will take top California vintners from Santa Barbara County to discerning wine and food enthusiasts in Phoenix (September 2013), Houston (October 2013), New Orleans (November 2013), Miami (December 2013) and Key West, Florida (January 2014). Wine enthusiasts, media, distributors, restaurateurs, and other guests will have opportunities to sample award-winning wines and to meet renowned winemakers in person or via Google Hangouts. California’s Central Coast now has 100,000 acres of vines and many of California’s best winemakers such as Steve Clifton (Brewer-Clifton), Morgan Clendenen (Clendenen Wines), Wes Hagen (Clos Pepe), Norm Yost (Flying Goat Cellars), and Mickael Sigoin (Beckman Vineyards and Kaena Wines). The tour was founded by intrepid traveler and photographer William Fernandez who criss crossed the United States for three years in a Winnebago, searching for the best slice of the county to put down roots before returning to the Santa Ynez Valley. 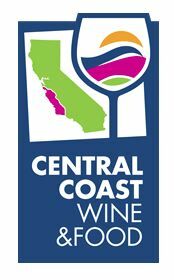 For more information, visit www.CentralCoastCA.com. First Annual Fort Ross-Seaview Wine Festival This event celebrates Sonoma County’s newest AVA and will be held on an ocean terrace at the historic Fort Ross State Park. The Festival is presented by the Fort Ross-Seaview Winegrowers on Saturday, October 26 will offer a Grand Luncheon prepared by renowned Sonoma County chefs and a Grand Tasting. Participating wineries include Del Dotto, Fort Ross Vineyard, Martinelli Winery, Pahlmeyer, Siduri, Tin Barn, Wild Hog Vineyard, William Selyem and more. For more Festival information, visit www.fortross.org/festival.htm. 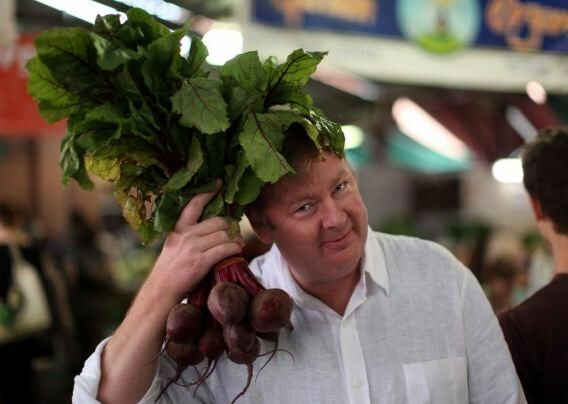 The Wandering Palate New Zealand Red Wine of the Lunar Year (Dragon) Veteran sommelier Curtis Marsh writes poignantly about the food and wine of New Zealand. You would be well served to seek out his website at www.thewanderingpalate to read the poem (or song) “Bastards of Pinot Noir,” inspired by the New Zealand Pinot Noir Celebration 2013, as well as his latest coverage of the Biodynamic Vigneron of the Lunar Year, Felton Road and its 2011 Cornish Point Central Otago Pinot Noir. Resurgence in the Use of Concrete Wine Tanks Sonoma Cast Stone, a nineteen year-old wine country maker of innovative precast concrete, was asked by a group of seven Napa and Sonoma winemakers several years ago to develop the perfect concrete wine tank. Originally the company began with an egg-shaped tank, but since then, a variety of square, rectangle, and conical tanks have been added to the lineup. If you have visited a Northern California winery recently, you probably have seen concrete tanks of some variety sitting amongst the stainless steel tanks. Sonoma Cast Stone is challenging the French dominance of concrete wine tanks. 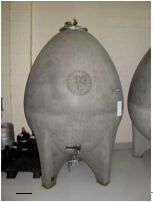 Historically, there has been a long tradition in Europe of fermenting and often storing wine in large concrete vats. The resurgence of concrete in fermentation in North America is a fascinating story. Concrete is a natural insulator and keeps wine at cooler and more consistent temperatures. Tanks made today can include an embedded glycol temperature control system that gives the winemaker precise control and yet keeps the system separate from the wine. Concrete breathes, allowing oxygen to soften the wine, yet it is a neutral vessel, imparting only a hint of minerality. Winemakers often comment that wine made in concrete allows the wine to remain pure and tasting more like where it is from. Even color intensity of the finished wine is noticeably richer. Today, many famous Napa wineries such has Harlan, Screaming Eagle, Rudd and Quintessa are converting to concrete. A number of Pinot Noir producers in Sonoma County are employing concrete tanks as ancillary fermenting vessels, including Arista, Kosta Browne, Wind Gap Wines, Thomas George Estates (photo below) and Williams Selyem. For more information, visit www.concretewinetanks.com. Couloir Wines/Straight Line Wine Launch Marin County Tasting Room Couloir’s first dedicated tasting room has opened in downtown Tiburon at 72 Main Street on historic Ark Row. Library wines and large format bottles are offered along with current releases in side-by-side flights, by the glass, and by the bottle. The new tasting room is also open to the public for wine tastings, takeaway sales and special events. Owner and winemaker, Jon Grant, crafts small batch, single vineyard designated Pinot Noirs under the Couloir label that I can easily recommend. Straight Line Wine is produced from top appellations at a reasonable price. Total production for both brands is about 2,000 cases. 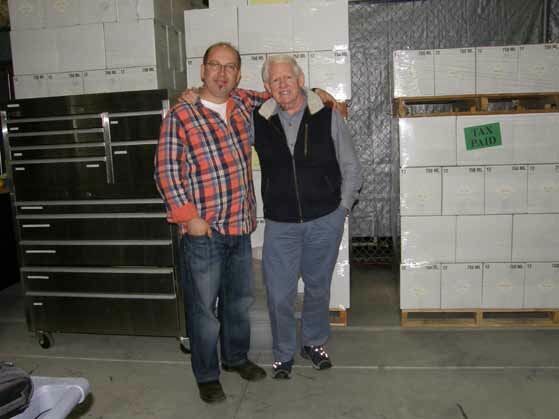 Grant worked in the cellars of many of the top Napa Valley wineries including Turley Wine Cellars, Plumpjack Winery, Corison Wines and Robert Mondavi Winery before founding Couloir Wines and Straight Line Wine in 2007. Visit www.couloirwines.com. Pinot Noir Shootout and Summit The 12th Annual Pinot Noir Shootout is now accepting entries from wineries. The Shootout finals will be December 14, 2013, in San Francisco. 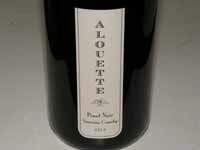 The finalists will be featured at the Pinot Noir Summit in San Francisco in late February 2014. For a submission form or more information contact Barbara Drady at barbara@affairsofthevine.com. Wine & Spirits 2014 Wineries of the Year Pinot Noir focused producers that made the list include Adelsheim, Bergström, Bindi, Domaine Bouchard Père & Fils, Calera, Domaine Drouhin, Drew, Elk Cove, Felton Road, Gloria Ferrer, Hirsch, Iron Horse, J. Christopher, LIOCO, Rippon, Truchard, Domaine de la Vougeraie, and Williams Selyem. Not surprisingly, most of these producers are high-profile wineries with significant marketing muscle. Santa Barbara County Celebration of Harvest This event offers four days in Santa Barbara Wine Country, October 11-14, featuring winemaker dinners, open houses and a Grand Tasting and Silent Auction on the grounds of Rancho Sisquoc Winery where over 100 wineries will be pouring. It is a time when winemakers, vineyard managers and all those working in the vineyard and winery trenches come up for air and celebrate the vintage. Visit www.celebrationofharvest.com for more information. Wine Doctor Preservation Kit This innovative product includes a Grip-Touch Vacuum Pump to evacuate oxygen from a bottle after a bottle of wine is poured and seals it tight with a special True-Seal™ stopper that prevents oxygen from leaking into the bottle after the seal is made. A unique red indicator shows that the seal is achieved and if at some time the seal has been compromised. Sunset said it was the most effective device of its kind that they have tested. Available at www.savethewine.com from $25. 2013 Sonoma County Harvest Fair to Honor Sangiacomo Family The Sangiacomo family is to receive the Lifetime Contribution to Sonoma County Wine Industry Award this year at the Harvest Fair held in Santa Rosa, California, October 4-6. Sangiacomo Family Vineyards has been one of the top growers in Sonoma County since 1969, with vineyards in Carneros, Sonoma Valley and the Sonoma Coast. The first winery to bottle a vineyard-designated Sangiacomo wine was Gundlach Bundschu according the Press Democrat (September 16, 2013). Currently, there are 76 wineries sourcing grapes from the Sangiacomo family. Visit www.harvestfair.org. Pinot Noir Vines in Malibu, California Actor and director Emilio Estevez produces wine at Casa Dumetz with his winemaker spouse Sonja Magdevski. Estevez dug up the front and back yard at his Malibu farm and planted 800 Pinot Noir vines including clones 667, 777 and 115. 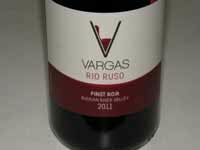 The couple tend the vines themselves and hope to average 50 cases in a good year. The winery also sources other varieties from the Santa Ynez Valley. A tasting room is located in historic Los Alamos. Visit www.casadumetzwines.com. ¡Salud! Oregon Pinot Noir Auction Tickets on Sale Oregon winemakers will debut the 2012 vintage at this benefit for Oregon’s seasonal vineyard workers and their families. This event is the only opportunity to acquire unique cuvées made exclusively for ¡Salud!. The Cuvée Tasting and Auction is November 8 at Domaine Drouhin Oregon winery and the Dinner and Auction Gala is in Portland at The Governor Hotel on November 9. For information and tickets, visit www.saludauction.org. 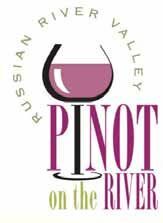 Russian River Valley in San Francisco The Russian River Valley Winegrowers and Uncorked Events present a tasting of Russian River Valley single vineyard wines on Wednesday, October 23, at the General’s Residence at Fort Mason. More than 25 winemakers and winegrowers will be pouring small lot, single vineyard wines. Participating wineries include Balletto Vineyards & Winery, Davis Family Vineyards, Inman Family Wines, John Tyler Wines/Bacigalupi Vineyards, Joseph Swan Vineyards, La Crema, La Follette, Siduri, Suacci-Carciere, Thomas George Estates, Valdez Family Winery and Williams Selyem. Complementing the wines will be bites of food and DJ Sol will be spinning grooves. Silent auction items will also be on display, benefiting the Russian River Valley Winegrowers continued efforts to preserve the region’s agriculture legacy. Tickets are available at www.singlevineyard.eventbrite.com or visit www.rrvw.org.